I was in my local LEGO store this weekend taking advantage of double VIP points and I noticed that they were rearranging/restocking the PaB wall. Looking to spend some of my new VIP points, I swung by the store last night and was a more than a little disappointed by what they'd changed. 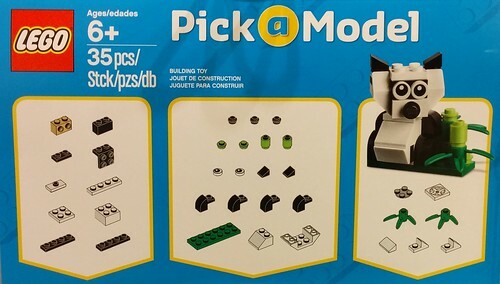 They now have a "Pick a Model" program, where they display two models on display and fill about half of the PaB bins will the parts for those two models. The models will cost $4.99 each and the store employee explained to me that customers will not be allowed to include the "Pick a Model" parts in regular PaB cups. The models weren't awesome, and the parts used in them weren't all that exciting either. If memory serves, they were a giraffe and an prop plane. I didn't do a piece count on either model, but just eyeballing them they looked to be at or above the golden ratio. Obviously, this is bad news because it really limits the number of different pieces on the wall. But, as the Brick Specialist pointed out to me, there really isn't any way for store staff to police the wall, especially on a weekend or during any other busy time and he expected the "Pick a Model" pieces would end up in regular cups. Also, according to the Brick Specialist pointed out to me, The "Pick a Model Experience" had been piloted at several stores last year and it was well received. See here. Strangely, there's been very little discussion of the change on the LEGO oriented web. Just NeoGAF and Toys n Bricks from what I could see. Thanks for the heads up. My nearest store is 2 hours away and if I hadn't known there would have been some regrets. Truly deep down I know this isn't the case but part of me wants a APRIL FOOLS ending on this. The 2nd & Charles store near me has bins of used Legos for $1/ounce, I would assume other stores probably have the same, although they aren't that common. I was at my local store last weekend and they had the changes done, but nobody stopped me from putting any of the Pick-A-Model parts in the either of the two large cups I filled. I can't imagine that actually being something LEGO would do. Can you think of a good way to tell a kid he can pick any part from this wall for his cup except these parts because they're special without some kind of conflict? While the "Pick A Model scare of April 2015" seems to have been much ado about nothing (the three Lego stores I've been to since 01Apr2015 have had no issue with adding Pick A Model parts to Pick A Brick cups), we have seen some good parts as a result. 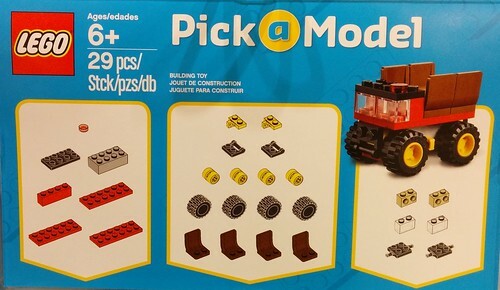 The models from Apr2015 included yellow 1-stud SNOT bricks, black 1x1 round plates, black 1x1 cones, and now the back of the July 2015 Store Calendar shows an alligator model that contains green headlights, green 1x2 brackets, green 1x2 bows, and a few other good pieces. While I can't find a pic anywhere yet, the manager at my local Lego store confirmed today that there will be a "little green jeep of some sort" along with the alligator. If green is your color, the PaB wall will be great come July first. Regardless, it never hurts to have a plethora of colors. And Jeeps have headlights. Good chance for headlight bricks or lampholders. When the End of the World comes, I can assure you, I will be partying to hard to notice. NimbusAConflict wrote: Regardless, it never hurts to have a plethora of colors. And Jeeps have headlights. Good chance for headlight bricks or lampholders. Looks like the alligator in the flyer is using them for the eyes. 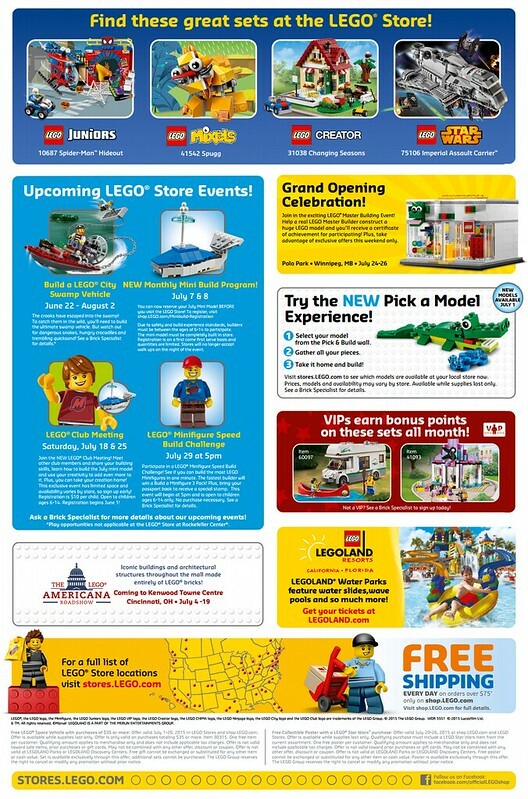 July Pick-a-Model page on Lego site. Even more good pieces with the reveal of the little jeep. I'll be visiting my local in the next day or two. We'll see how many green headlights and black 1x4 bars they'll let me buy. Pic's linked on reddit show parts lists.1x2 and 1x4 bows. Silver 1x1 round tiles. The South Coast Plaza store in Costa Mesa, CA didn't have any problems with me filling up the large cup full of green pieces that were PaM. It was pretty obvious what the cup was filled with. In fact, I was completely oblivious to the selection restrictions until I read this topic this morning. Oops. My local has no limits. Filled a small cup with only headlights. No limits to the point of allowing PaM parts to run out. My local is currently out of the dark grey 1x2 grill brick until they can order more. So far the PaM concept has been good for building tiny robots, better than the times when they had a dozen different colors of 2x4 bricks. I was told the other day, by the manager at my local Lego store, that the current Build-A-Model parts will probably be swapping out at the end of the month. So if you want all those interesting Green pieces, now's the time to get them. Yep, Oct 1st should be the debut for the next PaM's if TLG keeps to their quarterly schedule. Any info on what the next PaM's will be? I haven't seen any previews or leaks. Also my official UMFL designs are going to be green-heavy until the end of time/I get sick of it, so if that's your jam, stock up. Oct2015 Pick-a-Model page on Lego site. Not great models. Hmmnn, I wonder if we could get them to build a Classic as part of this. The part count should be low enough. Anyway. The 1x2 Trans-Clear bricks and the 1x1 Lime Round Bricks are going to make their way into my PaB choices. I stopped in at my local today. The models really are rather forgettable and the parts list is uninspiring. I actually had a hard time filling a small cup. There are good MFZ pcs though. I noted that my local was missing two parts for the "truck/lorry": the trans red 1x1 rnd tile and the brown chairs. - There was a pre-made little sign from TLG with the truck containing a little apology for being short parts so it looks like TLG is expecting this. - My local had white chairs instead of brown. Not sure if they filled the bin with what they had or if TLG is deviating on color. I find the second highly unlikely. Maybe a couple K boxes were just late. EDIT: I gave this lackluster pile of parts a SSC go, but no joy. While there is a SNOT brick and a SNOT bracket, both are large and not MFZ friendly. Also, there's a handle, but no clip and only one side of a clickhinge. Good parts, just not an easy frame. Some interesting news about the PaB Wall. While the parts list doesn't look great for MFZ, I think there's promise. - The new headlights can be chained easily for articulated arms/legs and will fit onto the handles too.